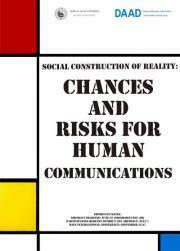 Dear students of social sciences and of the field of humanityWe are happy to announce about the upcoming International Conference “Social Construction of Reality: Chances and Risks for Human Communications“ in honor of the world known sociologist Thomas Luckmann, on September 24-28. The conference is organized by the Sociology Department of Yerevan State University in cooperation with German Academic Exchange Service (DAAD). Working language of the conference is English (presentations could be made in German as well). We are planning to publish conference outputs. 1. Title of your presentation should be mentioned at the beginning. 2. Below the title, please, write your name/last name, institution and contact details. 3. Abstract of the presentation. The students are free in the choice of topic.